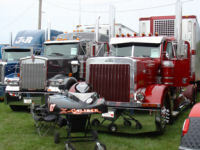 Wisconsin Refrigerated is a small, family owned, financially stable refrigerated trucking company and brokerage. Originally started in 1982 with one truck, the company has grown on the philosophy of honesty, hard work and impeccable service. Currently, with over 200 customers, we are specializing in refrigerated truckload quantity freight, with minimal waits and handling. We want to provide the best service, in addition to, a friendly staff that goes out of it's way to help the customer. Do the extra special things others do not. We shall win customers away from the competition through better service and a better price value. We are currently in "expansion mode"
We are currently in "expansion mode" and are seeking hard working, quality drivers that want to make big money. Learn more! Placed 1st Horns (Loudest) and 2nd overall in our division. Placed 1st in our division. Copyright © 1997-2019 Wisconsin Refrigeration. All rights reserved.